There was a report doing the rounds recently after the ONS released statistics showing that the richest parts of Wales were actually poorer than the poorest parts of London. The story was covered by The Daily Wales and the graphic they used appears to have originated from The Independent. After a quick look at the data the headline appears to be a classic case of slight of hand by the London media. The data for this is available here (.pdf) and the part we're going to look at is on page 27. Not long after the announcement of the Holyhead 'kites' there was another renewables scheme hitting the news, this time in Radyr which is a few miles away from the centre of Cardiff. Unlike the 'kites', the design for Radyr is one that doesn't make Wales a guinea pig for new and unproven technology. The design for Radyr features an Archimedes screw, except instead of needing power to lift water from a lower level to a higher level the water will drive the screw as it descends to a lower level. Archimedes screws have been used for thousands of years, consequently this makes it far cheaper to implement which should mean a far cheaper price strike in order to pay back investors. 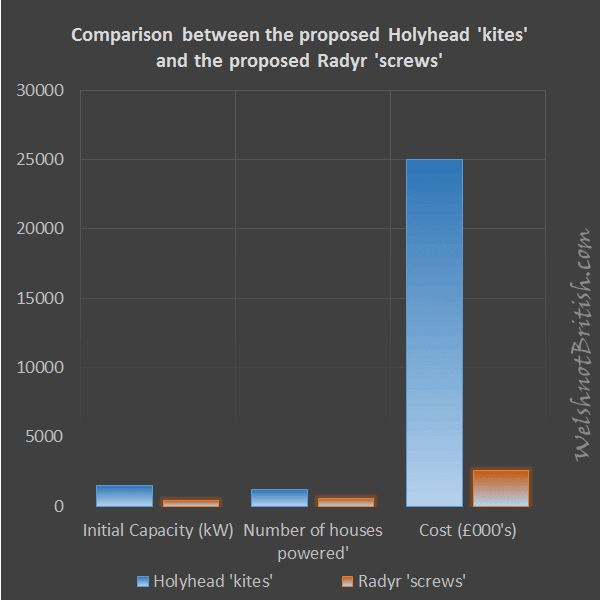 The EBC tells us that the screws will cost £2.6m which is just under ten times cheaper than the £25m the kites off Holyhead will cost. They also tell us that it will power 550 homes, the company behind it tell us that it has the potential for 391kW (compared with the initial 1500kW for the kites). If these numbers stack up then it means the screws are a far more efficient and cost effective method of generating power than the kites. 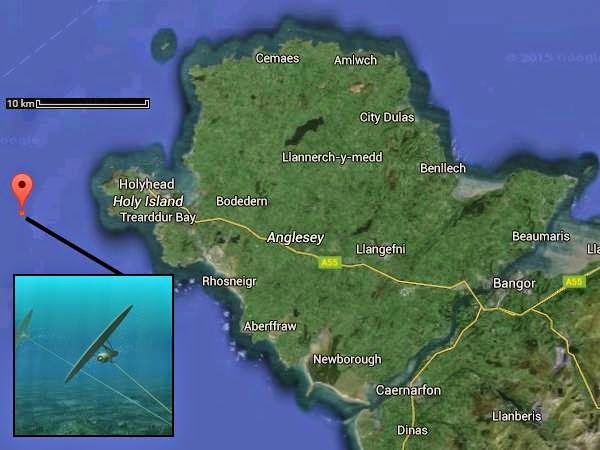 Wales has been chosen to be a guinea pig for a new type of marine turbine, the 'kites' as they are being called are set to be installed a few kilometres off the coast of Holyhead. But even a cursory read of the news article should be enough to set the alarm bells off. Map showing the location where the 'kites' (inset) will be installed. Millions of tax payers breathed a sigh of relief when it was announced back in June 2014 that serial trough guzzler Peter Hain was to stand down from his safe Neath seat at the elections of May 2015. 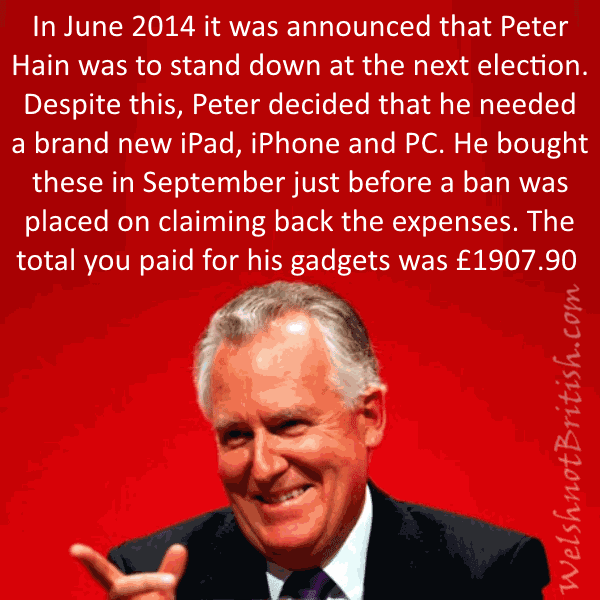 It has now been revealed that sometime in September, just before a ban was imposed on capital purchases, Labour's Peter Hain bought himself a new iPad, iPhone and a new PC. He then proceeded to claim these items back. The total for these items is an eye watering £1,907.90. 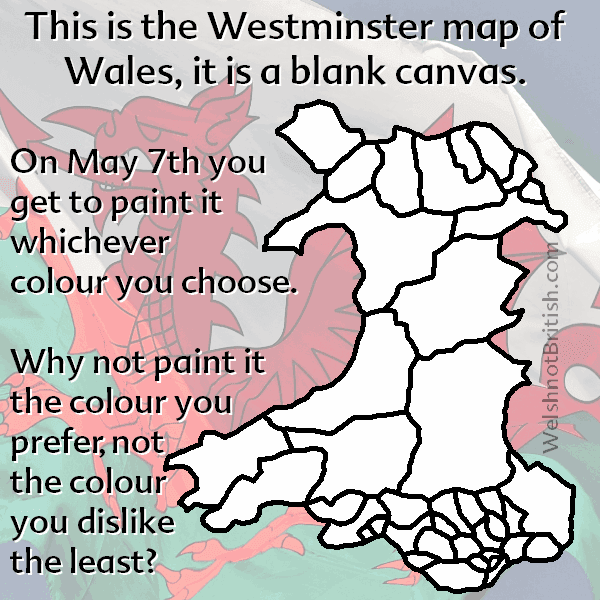 Ahead of the 2015 general election Wales had the opportunity to paint itself whatever colour it wanted to. We had a blank canvass, a chance to reject the two party politics that dominates the UK. I don't know about you but for me the most important thing for an MP representing a Welsh constituency to do is to actually turn up at their place of work when they are discussing Wales in order to vote on matters concerning Wales and the people of Wales. 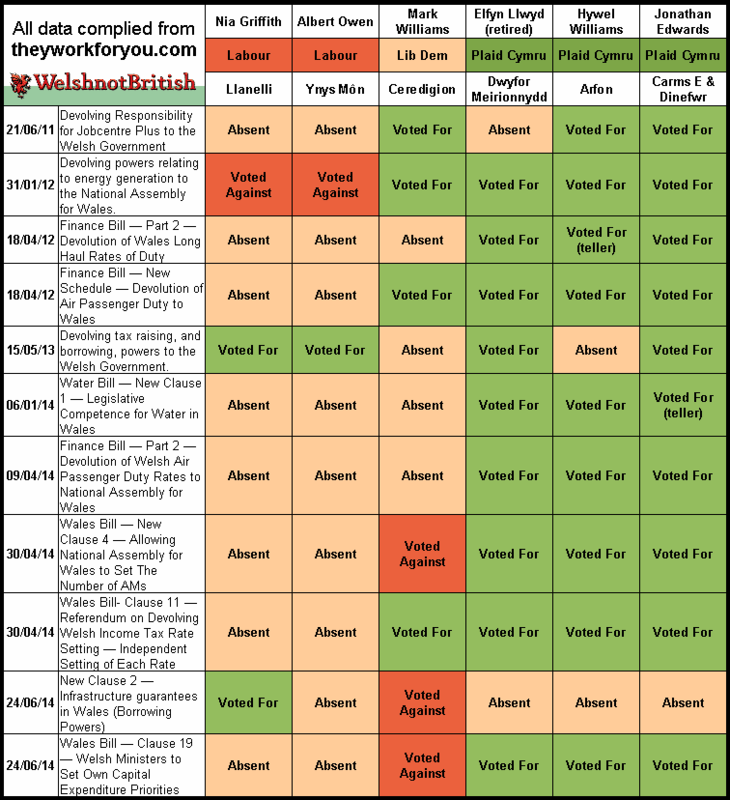 I used the website theyworkforyou.com in order to look at the three MPs in the Plaid Cymru target seats of Llanelli, Ynys Môn and Ceredigion. I've then looked at the three MPs who held seats for Plaid Cymru at the last election in order to see what the difference was. I appear to have upset some members of the Welsh branch of London Labour. Not only do they object to being called scumbags but they also object to being called Red Tories. Here I will explain why I describe them as scumbag Red Tories and why this is appropriate. The scumbag comes from the Scumbag Steve meme. Originally the picture featured Blake Boston wearing the now infamous sideways checkered cap that would go on to become a meme of its own. In its most basic form the meme follows the following pattern. Says something, does opposite. Thankfully my skills have improved a bit since then. Here is an example of one of the very first scumbag posts I did entitled 'Scumbag Labour - Post Offices'. 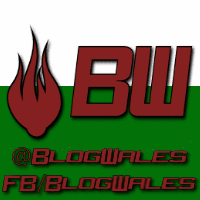 Thankfully my graphics skills, whilst still limited, have improved since then. 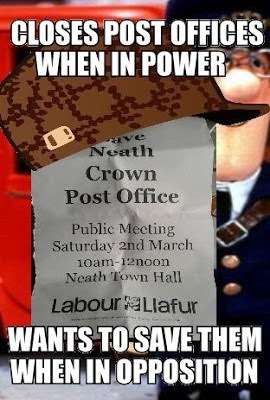 The post depicts how Labour closed Post Offices when they were in power and then campaigned to save them when in opposition. I don't think anyone will be in any doubt that this behaviour fits perfectly within the definitions of the original meme. The article mentions former MP Peter Hain but I also could have included other Red Tories such as Albert Owen of Ynys Môn or Llanelli's Nia Griffith as they exhibited similar behaviour. The Cambridge Dictionaries Online would also tell you that their definition of a scumbag is a very unpleasant person who has done something dishonest or unacceptable. To date I have made dozens of posts calling Labour out for their scumbag behaviour, you can find them all with the scumbag tag I use to group similar posts so feel free to look through them in order to make your own mind up whether or not the description of scumbag is merited or not. 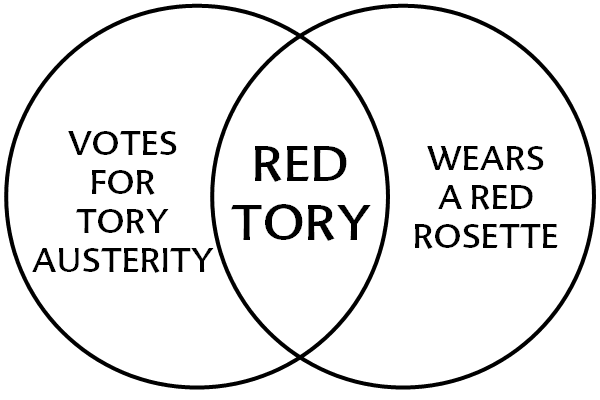 As for the Red Tories description, well that is a far easier one to describe and I have created a simple Venn diagram in order to highlight why Labour are commonly known as Red Tories. As I said, it's quite simple but for the hard of understanding and the members of the Welsh branch of London Labour I will explain it. In the left circle we have 'votes for Tory austerity' and in the right circle we have 'wears a red rosette'. In the middle we have a cross-over depicting people who wear a red rosette AND vote for Tory austerity. It is these people who are the Red Tories. 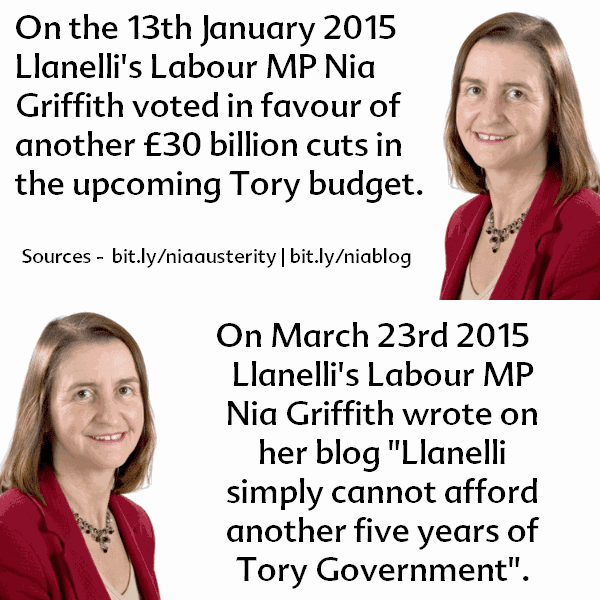 People like Llanelli's Nia Griffith for example. 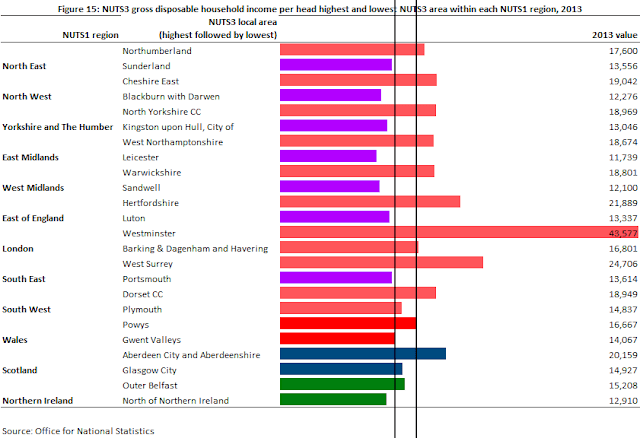 It wasn't only Nia who voted for Tory austerity, many more of her fellow Red Tories did too. This graphic depicts how Nia, who wears a red rosette voted for Tory austerity. That means she is a Red Tory. The graphic also mentions how, on her blog, she commented that "Llanelli simply cannot afford another five years of Tory Government". And the sheer audacity and hypocrisy of this comment, written after she had voted for another £30 billion of Tory austerity is what makes her a scumbag. I don't make the definitions here, I am just using already pre-defined definitions to describe elected politicians that fit those definitions. There is absolutely no doubt that someone who did what Nia has done would, quite rightly, be described as a very unpleasant person who has done something dishonest or unacceptable. We're about to have a general election, and whether or not some of the politicians I have mentioned are still holding court after the election is up to the people. If they want to elect scumbags then scumbags they shall have. But I will not change my descriptions of them just because the people who support these scumbags are so distanced from reality that they can not accept how far from their origins the Labour party has become. We're seeing it in Scotland and hopefully we are starting to see it in Wales. People on the left do not leave Labour, Labour leaves them.